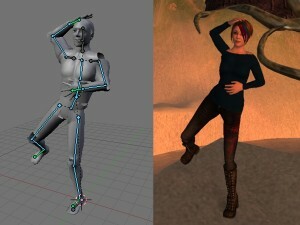 Long-time readers may recall my post last December about an animation exporter project I had been working on. I’ve been meaning to release it to the public for a long time now, but never got around to it… until today! This script is the product of countless hours of study, effort,and tweaking. I had intended to use it myself to create and sell animations in Second Life, but plans and interests change, and I don’t see myself doing that anymore. So, rather than keep it to myself, or let it linger untouched on my hard drive until the heat-death of the universe, I’ve decided to release it for the benefit of other animators and the general public. I hope some people find it it useful, and it makes their lives a little bit easier. But, I have no interest in maintaining or providing support for it. So, if you can’t figure out how to use it, find someone else to teach you. If it stops working, find someone else to fix it. If you need it to do something new, find someone else to improve it. I’m not trying to be rude. I’m sure you’re a very nice person. But I have a lot of ideas, and not a lot of time to spend on things that don’t interest me anymore. So there you have it. Go free, little exporter! Go free!